I’ve been a loyal customer of Marmot’s waterpoof, breathable rain jackets for several years. I’m on my third (or fourth?) Marmot rain jacket currently and my wife and daughter have them as well. Everything wears out eventually. Here’s what happened to our most recent ones. Caution: shop talk blog post intended for do-it-yourselfers. For my recent 240-mile journey I created what I call my “trip batteries”—batteries that I can attach to my bike to augment my regular batteries, but that I don’t intend to carry around on a daily basis. As such, the main design criteria for these batteries is that they be inexpensive. I don’t want to pay the big bucks for a battery that I only use once in a while. The obvious choice is SLA (sealed lead acid) batteries. These are the same kind of batteries used in cars, and the technology is almost 100 years old. E-bikers out there may poo-poo this choice of battery. After all, compared to my lithium batteries, my SLA batteries are heavy (20lbs vs. the lithium’s 15lbs), not quite as powerful (600wh vs. the lithium’s 720wh), don’t last as long (300 charge cycles vs. the lithium’s 1,500) and they are dumb (that is, they don’t have a battery management circuit board in them to prevent human error from damaging them, although most controllers provide the necessary protections). But they are cheap. I can put together a 10ah 36v battery for about $120 versus a 10ah 36v battery for $600. The day began overcast. Not a good start for the Solar Xpedition. But by midday Mr. Sun broke through and the watt hours came rolling in. I ran with my solar panel connected to the working battery (rather than the spare). It was exciting to see the power drop as I went up a hill and then gradually be restored by the panel. My power use went very well the first day. I didn’t even need to get out the spare battery. It’s hard to know how much of the 500 watt hours I used the first day was supplied by the panel since I don’t yet have a way to measure watt-hours output. But I estimate that the battery had 360 to start with, the solar panel added 70 and charging at a restaurant while eating dinner added 70. Many things didn’t go well, in particular 7 flat tires and swarms of mosquitos at my campsite. charging up while I take a nap. I use them to extend the range of my electric cargo bike for long trips (plus they were fun to make). I will carry two batteries on my trip, each giving my bike a range of 20 to 40 miles. On a sunny day the solar panels can recharge one of the batteries while I am riding, adding an additional 20 to 40 miles for a total range of 60 to 120 miles a day. I anticipate some hills and I’ll be carrying a load, so a 60-mile range is probably more accurate. I may need to pedal the last few miles on some days. I plan to stay in a hotel some of the time and recharge my batteries there. Not really. The solar panels don’t produce enough electricity instantaneously. For example the solar panels only produce about 40 watts of power at a given moment, whereas my bicycle needs about 400 watts of power to go up a hill. The main purpose of the solar panels is to charge the battery over time. Since charging happens slowly, 40 watts is enough to charge the battery. It takes roughly 10 hours of charging to store one to two hours’ worth of electrified riding time in the battery. 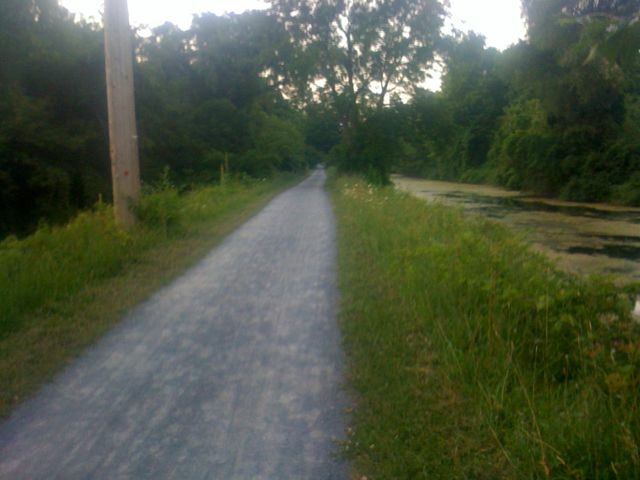 And one to two hours of riding translates into 15 to 30 miles. 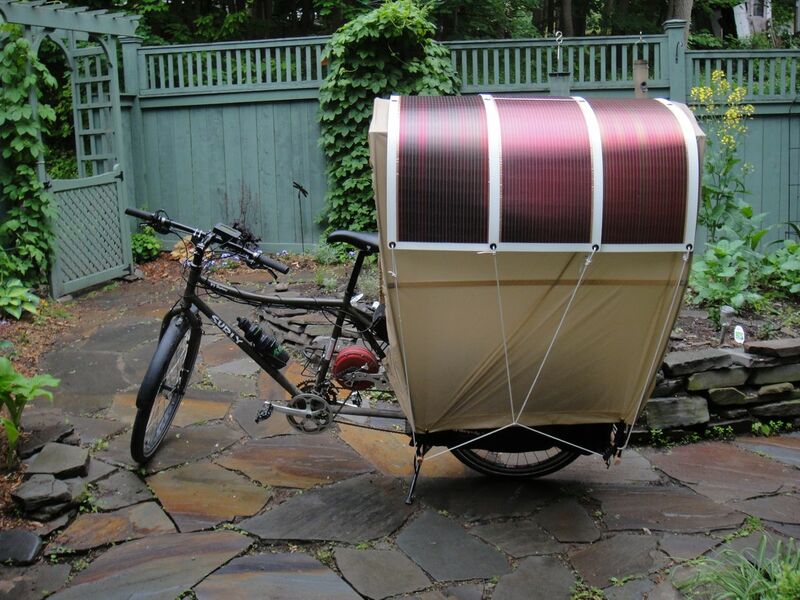 Total cost for a solar bicycle: $2050 to $4850. Not bad for a vehicle that can get you both out of the car and off the grid. In a previous post I described a canopy that Thea and I made for our Xtracycle to protect her from wind and rain. 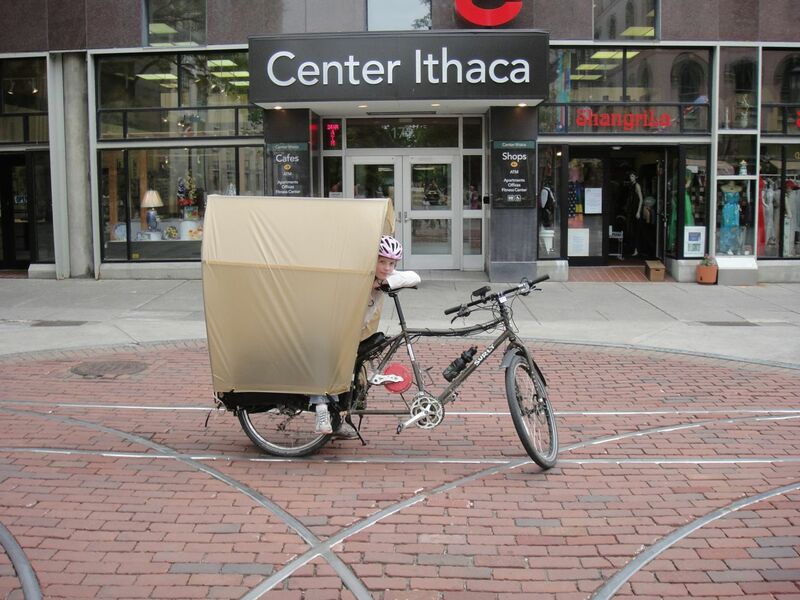 It looks sort of like a covered wagon on the back of our bike. It was easy to build without special tools or parts, did not require modifying our bike and cost us less than $150 for parts. It weighs about 2 lbs. and we can set it up in less than five minutes. Here’s how to make it. The rectangular canopy cover fits over the canopy frame and is secured at the bottom with tie-down straps. The front and back of the cover can be cinched up with a drawstring like a covered wagon. If you like, the cover’s size can be adjusted, along with the frame’s pole lengths, for different sizes of passenger. The size I give here is appropriate for a large child or small adult. 1. Cut the cloth so that it is 108″ (3 yards) by 60″. The 60″ edges will be along the sides of the canopy, and the 108″ edges will be the front and back. Hem the 60″ side edges first, then the 108″ front and back edges. Make the hems about 1.5″. 2. Next make the drawstrings. Using a stiff wire as a big sewing needle, insert about 12 feet of cord into the front hem, then repeat for the back hem. 3. Next use the grommet tool to insert two grommets on each 108″ side, about 18″ from the front and back (the video below shows how to use a grommet tool). If you are using thin cloth, reinforce it first with an iron-on patch. 4. Cut four 20″ lengths of webbing for the tie-down straps. For each strap, sew one end of the webbing to the female buckle and thread the other end of the webbing into the male buckle. Thread the straps into each grommet hole. The canopy frame “base” consists of two 7/8″ x 24″ wooden dowels that are inserted into the Xtracycle h-rack (horizontal) tubes and secured with wood screws. 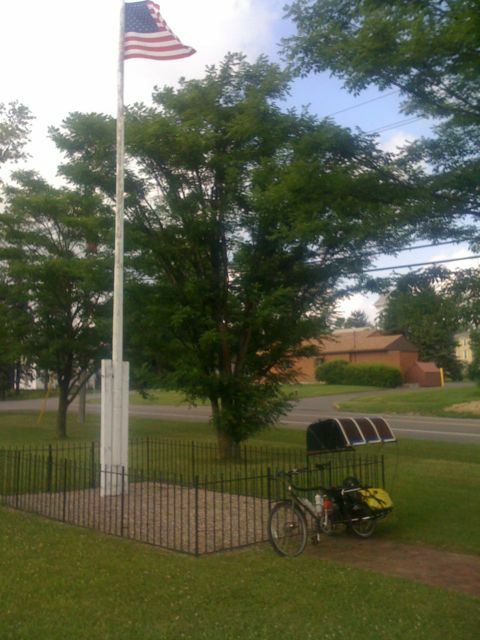 Aluminum tent poles are then erected upon this base: a front hoop, a rear hoop, and two cross pieces. 1. Cut the 7/8″ x 48″ dowel in half so that you have two 24″ pieces. 3. Insert a base pole into the Xtracycle h-rack, center it, and align the holes so that they are vertical. While holding the base pole in place, drill starter holes for the woodscrews where the h-rack tube has holes in its side. 4. Screw the base poles to the bike with the woodscrews. I just leave the base poles on my bike all the time. The front pole provides a nice footrest for passengers. 5. Next make the hoop poles. All you have to do for this step is cut four of the 18″ poles to 12″ (or a different length depending on your expected passenger size). The video below shows how to use a pipe cutter. 6. Next make the cross pieces from the .625″ poles. For each of the poles that have inserts drill a 11/32″ hole in the ends opposite the inserts, about 1/2″ from the end. 8. Drill a 9/64″ hole that goes through the elbow that is in the crosspiece. Screw the elbows into place with the four machine screws. 9. Cut two 6″ pieces from the .625″ tent pole that *doesn’t* have an insert. These will serve as the center parts of the cross pieces. CAUTION: do not leave your canopy frame uncovered. Without the cover it is only held together by friction. If jostled it could come loose and snap back with surprising force (and for example break a garage window as I learned from experience). DO NOT ride your bike with an uncovered frame (again as I learned from experience you don’t want to be picking up all 20 tent poles in traffic). 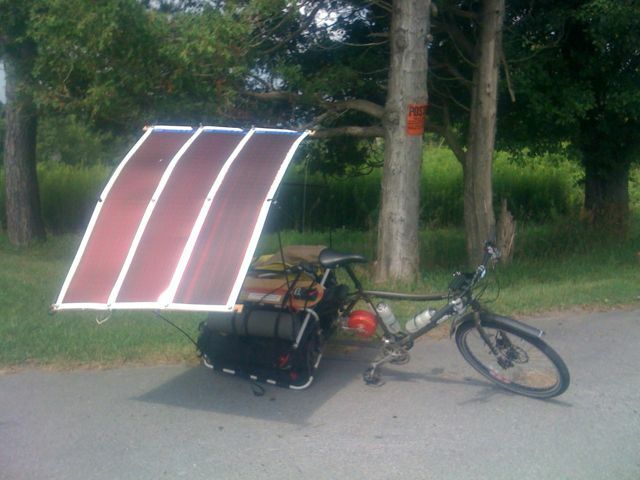 If you want to use the frame for some purpose other than the Bike Wagon canopy, consider putting a shock cord within it or using external guy wires as I do for using it to support my solar panels. Final step: do me the courtesy of sending me a photo of your finished canopy! If you have enough cloth left over you can use it to make a canopy sack. 1. Cut the cloth to 27″ x 20″. Hem the 20″ side. 2. Fold the cloth in half and sew the edge, leaving an opening for the drawstring at the ends of the hem. 3. Add the drawstring and a toggle. should weigh less than 10 lbs. All chronicles agree that a fully equipped Conestoga wagon in the days when those wagons were in their prime was a truly pleasing sight, giving one that sense of satisfaction which ever comes from the regard of any object, especially a piece of mechanism, which is perfectly fitted for the object it is designed to attain. I’m currently testing flexible solar panels mounted on top of the canopy. The solar panels should be able to double the range of my bike. And it may be possible that I can just park my bike outside and never have to connect it to an outlet again! 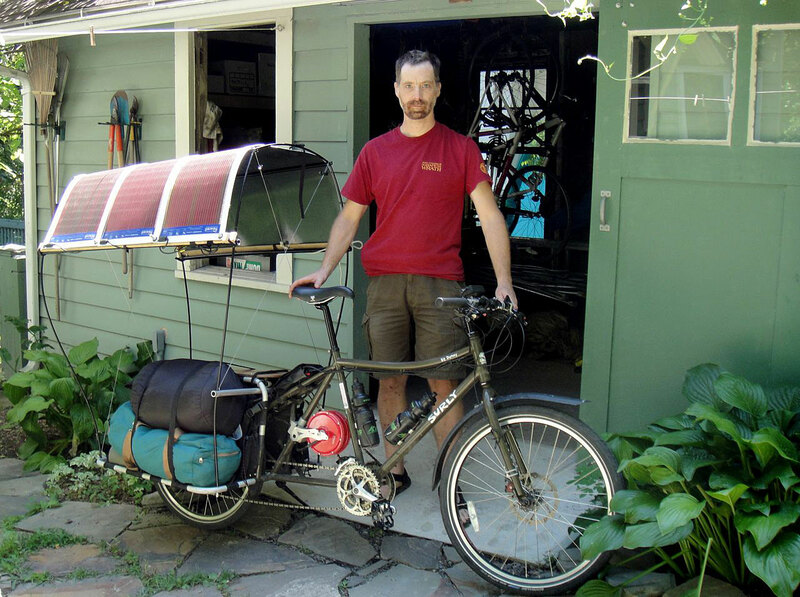 A solar-powered stoked Xtracycle may very well be one of the most practical solar vehicles available, if you measure practical in terms of being relatively inexpensive, having spare parts readily available, and being street legal. It’s not speedy or futuristic-looking, but it’s here now. can weigh up to 30 lbs. I’ve attached some sketches and photos of my Bike Wagon and Micro Car prototypes below, from past to present. The original prototype from last February. A Micro Car non-functional prototype using fiberglass poles. We subsequently chose aluminum tent poles because they are stiffer and stronger than fiberglass. Side view of the Micro Car prototype showing the central block with spreaders. Kinda pretty, like a biplane’s tail fin! Three quarter view of the passenger section. I made this prototype from pup tent parts. I considered many tent pole configurations. Road tests to determine what’s better: side by side or front and back hoops? The front and back hoops. We felt this geometry gave the best interior space. Front and back hoops on the road! Also covers the driver a bit! Thea sewing the canopy cover out of lightweight rip-stop nylon. We chose a rectangular cover so that sewing it would be easy. Also a rectangular cover can adjust to different pole configurations and is most suitable for supporting solar panels. I attached the canopy to a garden cart for transportation of several young ladies at Thea’s Laura-Ingalls-themed 10th birthday party. The penultimate prototype, rear view. …but this version, which has the hoop elbow embedded in a larger pole, performed well. I like to sketch an idea before building it. I used a 7/8″ dowel for the base. 3/4″ electrical metal tubing also works. The basically finished canopy rear view. The basically finished canopy front view.